With the large and prosperous market, China could be your most lucrative country to do business in. But doing business in China is not simple at all. China is considered by many businessmen to be the most difficult country to break into. 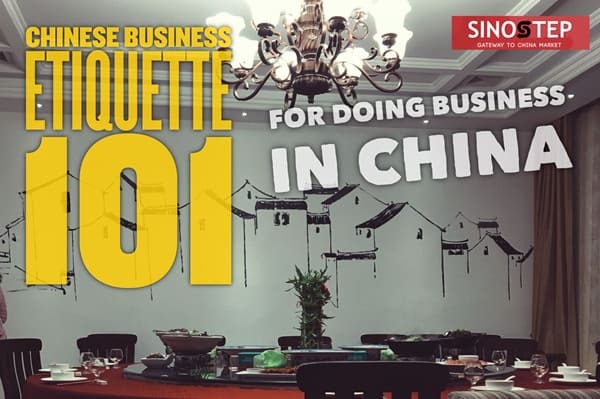 I’m sharing the basics of doing business in China as Chinese Business Etiquette 101, from my previous consulting experience helping overseas business owners enter into the China market. You can take it as a guide to avoid common mistakes which might ruin your business in China. Chinese don’t like doing business with individuals or companies they don’t know, so working through an intermediary is crucial. This could be an individual or an organization who can make a formal introduction and vouch for the credibility of you or your company. You have to impress and do business with decision makers at the very top. The normal cold call strategy would not work and you will never be taken seriously. The wise investment is to find a local partner or agent to help you arrange serious meetings and introduce valuable connections. Business relationships are built formally after the Chinese get to know you. Doing business in China is based heavily on personal relationships, which is called Guanxi. If you are not a friend, you are basically not a trusted business partner. Prove yourself to win the trust. Polite connections do not win your business. You might have to meet up several times to achieve your objectives. Be very patient. Normally it takes a considerable amount of time. You need time to find the right person and break through enormous bureaucracy. Send materials describing your company, its history, and your products / services, in well-translated Simplified Chinese version, or in bilingual version. The Chinese prefer face-to-face meetings rather than written or telephonic communication. For serious business cooperation, almost no agreement could be reached without meeting in person. Work through intermediaries to ask and answer questions to avoid possible misunderstandings and embarrassments through direct contact. Rank is extremely important in business relationships. Keep rank differences in mind all the time. Meals and social events are not the place for serious business discussions. Don’t be misled by the saying of “business is done during the meals”. Don’t talk on topics involving national integrity and potentially painful history. Don’t judge Chinese cleanliness or manners. The question “How many children do you have?” is not polite in China since most Chinese families only have one child in the past over thirty years, although the policy just changed. Popular topics includes education and ancient Chinese history. Appointments in advance. If possible, serious meetings should be made between one-to-two months in advance, preferably in writing with the meeting purpose, considering the tight schedules of both parties. A remind call or email before the meeting is also necessary, esp. when you need to fly across half of the globe and do not want to see the door closed. If you do not have a contact within the company, use an intermediary to arrange a formal introduction. Always show up on time, or slightly early, say 5-10 minutes. Punctuality is a virtue in Chinese culture. Arriving late is an insult, If traffic delays you, always call. Send an agenda before the meeting so your Chinese counterpart have the time to prepare prior to the meeting. Discuss the agenda with your translator/intermediary prior to the meeting. It is imperative that you bring your own interpreter or Chinese speaking local partner, be sure he/she understands the major concepts prior to the meeting. Written materials should be available in both English and Simplified Chinese. Be very careful about what is written. Make sure that written translations are accurate. Presentations should be detailed, factual and focus on long-term benefits. Visual aids are useful in large meetings. Colors have special meanings and if you are not careful, your color choice could work against you. Consult some expert if you want to make some good looking ones. A safe choice is to use black type on white background. Verify your data and numbers prior to the meeting and promise to give the accurate data after the meeting if you do not have. Trust are established on these details. Cold water is seldom available since it’s impolite in Chinese culture. After the meeting, accompany guests beyond the door of the office, or to the elevator. A normal practice is to accompany the high-ranking guest all the way to the car, and wait until the car has departed before leaving. Only senior members of the negotiating team will speak. Designate the most senior person in your group as your spokesman. Silence isn’t an invitation for others to talk. Silence gives one the opportunity to carefully consider what is being said and formulate an appropriate response. DON’T assume “yes” means yes, don’t be pushy. “We will think about it”, “I will look into it” sometimes means no. Try to figure out the reason behind the hesitance and try to find alternative solution. DON’T say NO in public, do it in private. Decisions are unlikely to be made during the meeting, they may take a long time, careful review and consideration are necessary. Your starting offer should always leave room for negotiation. You must be willing to show compromise and ensure Chinese negotiators feel they have gained major concessions. Contracts are important, but do not rely too much on them. Try to accumulate as little Chinese debt as possible. Don’t deliver too much before getting paid, or pay too much before getting something delivered. Women should wear conservative business suits or dresses with a high neckline. Women should avoid high heels and short sleeved blouses. It’s more important to know someone’s honorific title than to know his or her name. Feel free to drop the vice from their title when referring to them. The common combination of address is Surname + Title. If they want to move to another way of address, they will advise you which name to use. Pick a Chinese name if you want others remember you easily, but avoid common mistakes. Have your business card translated into Simplified Chinese and make sure the translation is correct. Your business card should include your title. If your company is the oldest or largest in your country, include the fact on your card as well. A sufficient supply of business cards will be required, you will need to give out cards to everyone you meet. It is quite embarrassed when you are out of the business cards. Use both hands to present your business cards, with Chinese side facing the recipient. Never deal out your cards across the table like a card game. Use both hands to receive business cards too. Never immediately put the card in a pocket or bag. Never put a card in your back pants pocket. Examine a business card before putting it on the table next to you or in a business card case. Never write on someone’s card unless so directed. Remark: I’d read some tips for doing business in China to instruct one to print in gold ink since gold is an auspicious color. This “golden” tip is obviously misleading. I do not think it’s wise to do so nowadays. One-sided gift-giving is awkward and sometimes improper gifts might be even considered as bribery. It’s best to arrange through your assistant or intermediary to see whether exchanging gifts is a good idea. In general, gifts are given at Chinese New Year, weddings, births, birthdays, and and more recently, Christmas. For business, it could be on some milestones of cooperation or memorial moments. Never give scissors, knives or other cutting utensils as they indicate the severing of the relationship. Never give clocks, handkerchiefs or straw sandals as they are associated with funerals and death. Clocks are the worst gift in China, however, watches are fine. Do not give white flowers, as many Chinese associate these with funerals. In Chinese tradition, Gifts are not opened when received. But young people can accept the western way to open the gift when they get it. Gifts may be refused once, twice or even three times before they are accepted, this is the Chinese tradition to show the humble attitude to accept any gift. 4 – Four is an unlucky number, because it sounds like the word “death” in mandarin Chinese. So do not give four of anything. 6- Six is considered a blessing for smoothness and progress. Entertaining guests at a Chinese banquet is a very popular and important way to establish relationship. Dining out is more preferred than at home, especially when entertaining foreigners. Don’t suggest meeting for dinner too late, basically Chinese eat at set hours, eg. 18:00 is normally a good time to suggest for a dinner. The host will always take a central seat opposite the door. There’s no cocktail hour before the dinner. Do not discuss business during the meal. Dishes are almost always ordered communally and shared. The host will see the guests to the door, or to the car. If you are invited to their house, consider it a great honor. Drinking is important part in Chinese entertaining. Drink some wine if you can, but not too much. Be prepared with an appropriate toast, safe topics for toasts are friendship, pledges for cooperation, mutual benefit and the desire to reciprocate the hospitality. The most common expression for toasting is Gan bei, meaning bottoms up, literally. Another expression, Sui yi, means “as you wish” or at your own pace. Do not pour your own drink. It is the responsibility of the host to attend to the guests. The person seated next to you may pour a drink for you. You should reciprocate. Drinking red wine is popular in bigger cities now in China, but some Chinese will mix it with Coke. In most occasions, you’ll be offered a grain alcohol, called Baijiu, it is very strong. Some times, the host will entertain a high-end distilled wine, mao-tai for most valued guests. Most Chinese hosts understand if you are unable to drink alcohol. You may use tea or a soft drink for the toast. Stating medical reasons is always a good way to get out of drinking alcohol. Do not sign any deal after drink. Like dining together, after-dinner entertainment is an excellent way to build personal relationship. One of the most popular entertainment is karaoke, or singing. Practice one or two songs well and enjoy it. Don’t sign any deal after drink. Wait and the host will arrange the seat for you. The guest of honor will sit facing the door. The host begins eating first, and offers the first toast.. Try everything that is offered to you. Be observant to other peoples’ needs. Do not put bones in your bowl. Place them on the table or in a special plate for that purpose. Never leave chopsticks sticking upright out of dishes. It’s the Chinese practice of leaving such dishes for the dead. Always place on a chopsticks rest or horizontally on the side of a dish. Tipping is not officially forbidden, but it is not common, most service staff in local hotels, restaurants and taxis do no expect tips, many western restaurants in China allow to accept tips and more local restaurant forbid the employees to take tips…. Younger workers prefer accept it although older workers still consider it an insult. Leaving a few coins is usually sufficient. If you want to acknowledge special service or assistance, do tip in private.